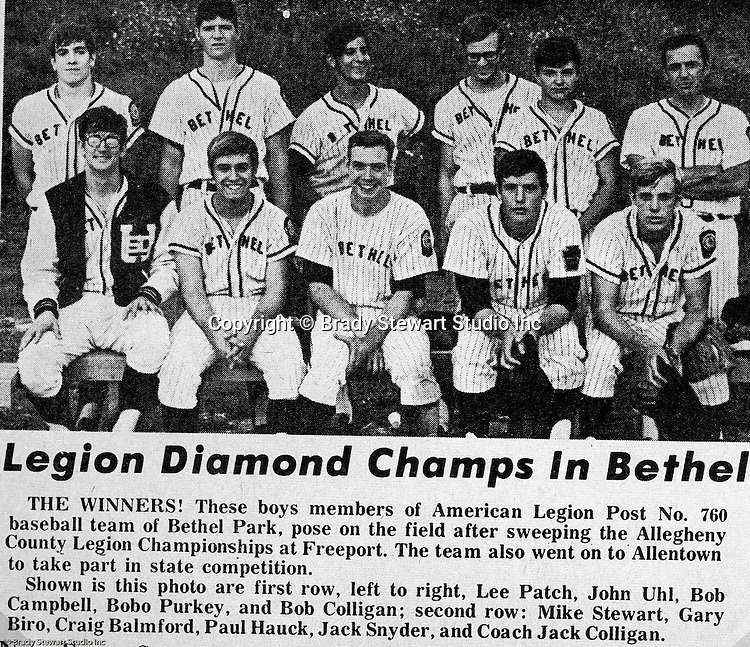 Bethel Park PA: Team photo of the Bethel Park American Legion Post No. 760 Baseball Team - 1970. This team was 14-3 in route to participating in the PA State American Legion Tournament in Allentown PA. The team included players from Bethel Park and Upper St Clair's baseball teams. The most amazing part of this story is that we only had 10 players on the team. We played over half the games with only nine players. We had two of the best pitchers in Western Pennsylvania; Bob Purkey Jr and Lee Patch. Lee Patch (P), Skip Uhl (OF), Bob Campbell (2B), Bob Purkey Jr (P & 1B), Bob Colligan (SS), Mike Stewart (C), Gary Biro (OF), Craig Balmford (3B), Paul HaucK (1B & OF), Jack Snyder (OF) and Bob Colligan Sr Coach. Jack Snyder (OF) and Bob Colligan Sr Coach.